The Archdiocese told NBC 10 that each item removed from St. Laurentius would be “catalogued and stored in a warehouse”. And once again, they are not giving the full truth. Mr. Edmund Rafferty, an employee (administrator) from The Archdiocese of Philadelphia oversaw Riley and Sons Moving company’s work. He seemed rather amiable; was simply doing his job. Mr. Edmund Rafferty is the coordinator of The Ecclesiastical Exchange. 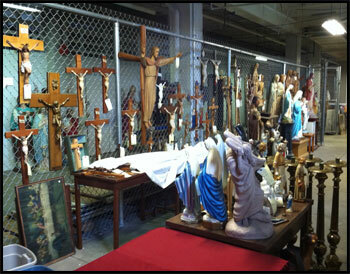 This exchange sells former sacred items from Catholic churches in the Archdiocese of Philadelphia.